The next day, the adventurers were up and about. They had lots to do and the lust for adventure still burned deep within them. They itched to get back across the bay to search more of Greystone—and in particular its ruined manor house. Before they could return to adventuring, however, several of the party had things to do around town. Thangrim disappeared for much of the morning while Tolirayth rested at the Orc’s Head. Of the others, Velonwe, Johann and Orm visioned the Last Chance—a tavern standing in the very shadows of Traitor’s Gate. Here they met Impi, the dour, black-clad barmaid, and Ruska Isotalo, a burly, gregarious giant of a woman who worked as a bounty hunter. A profusion of wanted posters covered one wall in the bar and the PCs also learnt that someone had—until recently—been stealing the bodies of those executed at Traitor’s Gate. (Of course, some people in the tavern thought the bodies were stealing themselves—animating after death to wreak revenge on those responsible for their deaths). In the afternoon, Johann visited the Great Forge to learn more about the fallen hold of Vongyth and his ancestral thunderaxe, which turned out to be a particularly ancient specimen. 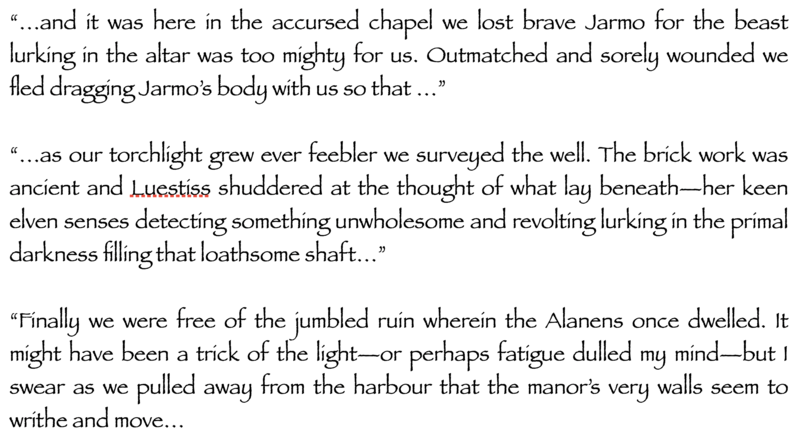 It transpired that a dormant power lurked within the thunderaxe, although the priest examining the weapon could not tell the dwarven warrior how to awake said power (or indeed what it was). The party also wanted to sell the beautiful amethyst recovered from the feral ghast they slew deep in the sepulchre’s bowels. At first they tried Anku Sennra’s Fine Diamonds and Other Gemstones (where they met an unpleasant nobleman, Jere Millo) but eventually struck a hard bargain at the decidedly downmarket Arlo’s Stones. Later in the day, several of the party were browsing the jumbled shelves at Kardagg’s Discount Emporium when they met another dwarf, Orithur, and his wolf companion, newly arrived at the city. Orithur was in search of companions and agreed to come to the Orc’s Head to meet the rest of the party. This the dwarf did after his new friends discovered several hidden treasures among the shelves of battered, secondhand equipment. The finds, including a superbly balanced longsword, were quickly purchased and carried away before Kardagg realised his mistake. The next day, the party were ready to resume their adventures. Meeting again, at the docks they once again set sail on Taneli’s fishing boat. However, the party was now slightly larger and so Orm had to journey across the bay in his armoured rowboat of his own design. 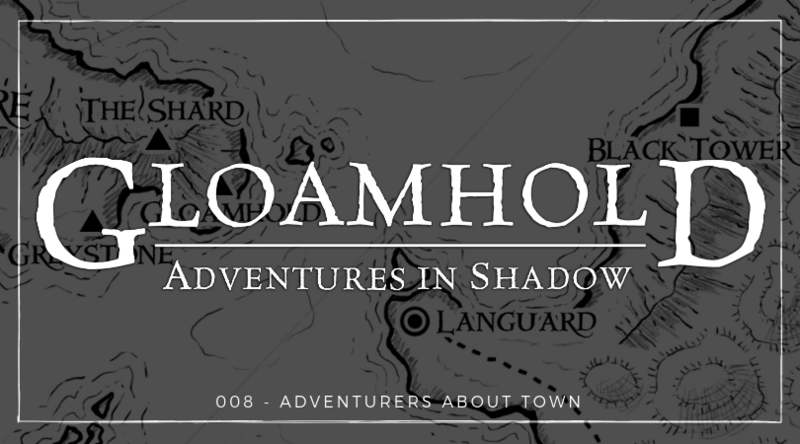 Tragedy almost struck on the journey when the two boats encountered a surprisingly heavy swell as they passed by Gloamhold. Taneli swore that several large, dark shapes in the water were nothing but rocks, but several of the heroes were not so sure and it was a relieved group that finally reached Greystone’s breakwater. Thus, perhaps with more on their minds than normal, the party crept up the twisting tunnel to the manor house. At the the head of the tunnel, they passed through a partially broken, scorched gate. The skeletal remains of some unfortunate—a dagger through his right eye socket—decorated the gate and this evidence of past violence lent the party extra caution as they emerged from the tunnel onto the windswept ledge upon which the ramshackle manor stood.